Queens College Ph.D. student Mason Youngblood is tracing the cultural evolution of birdsong through house finches. Photos courtesy of Queens College. These are not your typical college campus tweets. Queens College Ph.D. student Mason Youngblood’s work traces the cultural evolution of birdsong, which requires samplings. Around dawn, you can find him “birding” in neighborhoods like Forest Hills, Jamaica and Queens Village with a microphone and two undergraduate assistants in tow, trying to capture the sweet sounds of one bird: the tiny house finch. Youngblood, who studies comparative psychology and animal behavior, is not the first person from Queens College to study the sounds of finches. Late biologist Paul Mundinger created a database of house finch recordings in the 1970s, research that is still located in Queens College biology professor David Lahti’s laboratory. Both biologists are well regarded in the field of avian cultural evolution. Youngblood works in Lahti’s laboratory. 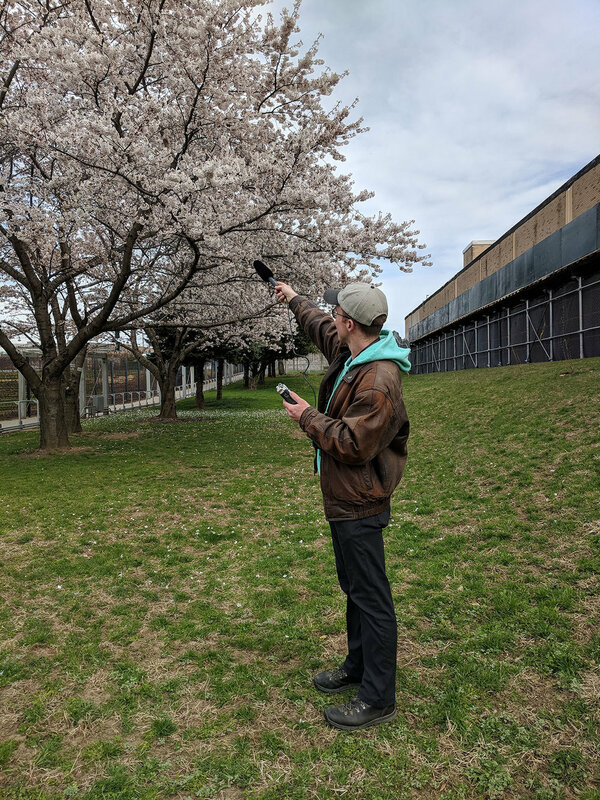 From now through July, Youngblood will be taking his research closer to home, tracking the birds that visit Queens College’s tree-filled campus. House finches are partially migratory, with some nesting in Queens and Long Island from March to September. Last year, Youngblood microchipped 150 house finches on campus to better track them; this year, he expects to chip an additional 50 to 100 finches. Youngblood hold a tiny house finch. Though Youngblood uses the practice for research, hobbyist “birding,” or birdwatching, can be a fruitful pastime in New York City. The New York City Audubon, a non-profit group dedicated to protecting wild birds, calls the birding in New York City “extraordinary,” in part due to its habitat diversity and its location in a major bird migratory route. Over 200 species of birds can be seen in the city, according to the group’s website. Popular spots to go birding in Queens, according to the New York City Audubon, include Jamaica Bay Wildlife Refuge, Fort Tilden, Forest Park and Alley Pond Park.